Sourav Ganguly, the legendary Indian Captain and the former Kolkata Knight Rider captain has been left out unsold in the IPL 4,2011 auction. What a surprise!As a cricket follower, i felt this as a personal embarrassment for a person who has contributed a huge part of his life for the welfare of the Indian Cricket. Not 1 team out of the 10 present there showed any signs of interest to buy the veteran player, which remained me about the true goals of a businessman. Although Ganguly is aged 38, and is considered old for the T20 games, his fans went on rampage at Kolkata citing any insult to their hero is an insult to them. Players that remained unsold apart from Sourav Ganguly are Chris Gayle, Mark Boucher, Jacob Oram, Sanath Jayasuriya, Brian Lara. It will be very interesting to note on how the reactions will be among the fans and the other cricketers as Ganguly remained unsold in latter part of the auction. 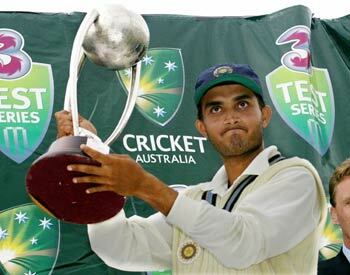 I believe this might be the end of the player we know as Ganguly. The readers should note that Ganguly retired from international cricket on 2007. After which he completely retired from all forms of cricket at 2010. His participation on IPL 3, 2010 itself was unclear which at the last moment he agreed to captain Kolkata knight riders. If your a Ganguly fan, share with us on how you feel about the IPL 4 auction. Previous: Facebook shutting down on March 15,2011? Next: American Renaissance Linked to Jared Loughner? 1. insult DADA = insult KOLKATA. 2. don’t use K(kolkata) and play only with KR(knight Riders). 3. ppl wont go to eden.. rather they will support the opponent. 4. SRK u lost min 75% crowd. 6. ppl r thinking to boycott SRK movies. It took a Khan from Delhi, who is a superstar in Mumbai now to buy a Kolkatta team and buy an expensive opener from Delhi & an all rounder from Baroda to end the awesome cricket career of the Prince of Kolkatta. Shame on you SRK! Go well & God’s speed always ‘Dada – Sourav Ganguly’ ! we will surely miss you. SHAME ON YOU SHAH RUKH KHAN! GOD’S SPEED TO YOU ALWAYS DADA – SOURAV! Hope all KKR fans ban the new team & not go to watch the games Live. this is not a cricketing decission! this is the aftermath of bitter politics which started with the Chappel controversy, the Sharad Pawar & Jagmon Dalmiya war for power and now the slimy, proud & vain SRK’s business interests.